The final home of the legendary Danish sailor said to have lived to be 146 years old. The plaque placed on the wall between the two sets of windows. Digger attempting to hide itself under 300 tons of rubble. A public display of random paleontology. The legend of Drakenberg has remained a mystery for decades. Did he actually live until the age of 146? It’s extremely unlikely, but Sophus Emil Johnsen, a Danish sailor and chandler, deeply believed that he did, and was so fascinated by Drakenberg, he spent many years of his life trying to spread the story of this remarkable man. He certainly had a lot of material to work with: The tales surrounding Drakenberg are numerous and fantastic. Drakenberg’s intermittent career as a sailor in the Danish navy included three stints fighting the Swedes, being captured by pirates, and 15 years as a slave under various masters in the Mediterranean before he escaped and made his way back to Denmark. Once on Danish soil with tales to tell, he became a favorite of the aristocracy who enjoyed his stories and showed him off as a living curiosity. Word of this extraordinary, feisty old man got around and in 1735 he was presented to King Christian VI where he was thanked for his war services under three Danish kings and received an annuity. 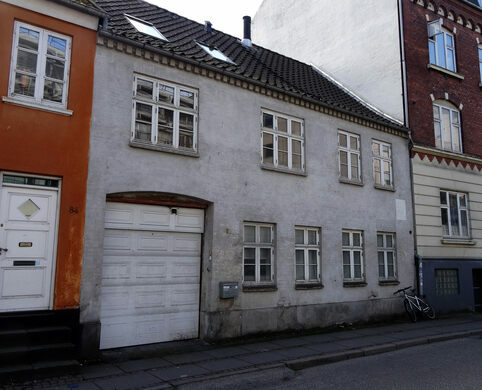 In 1760, supposedly at the ripe age of 134, Drakenberg arrived in Aarhus and became a lodger at Fiskergade 82—the house in which he would spend his last years. 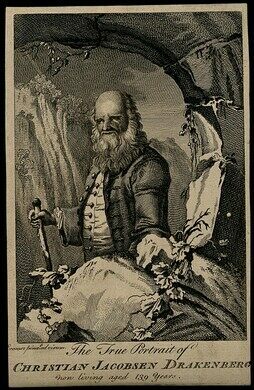 At the time, most people genuinely believed his tales, and with his huge white beard, he certainly looked the part. Today, these claims are looked at with a more skeptical eye. 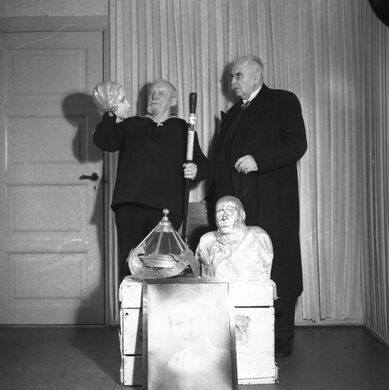 Inspired by his fellow sailor’s incredible life, Johnsen began to collect Drakenberg paraphernalia, and he claimed to have received permission to make a cast from Drakenberg’s mummified body. Johnsen had made his wealth as a ship chandler, but started spending more and more of his time on his obsession with Drakenberg. He built a house for his business and named it “Drakenberghus.” He published the periodical Drakenberg-posten, opened a Drakenberg museum north of Aarhus and introduced the Order of Drakenberg—a trophy in the form of a small brass cannon given to people Johnsen deemed worthy. Past recipients include Winston Churchill and Vera Lynn. This obsession with Drakenberg would eventually drive him to ruin and madness. Johnsen himself became something of a legend, zealously defending Drak’s legacy in increasingly incoherent letters to the local newspaper, walking his pet goat through town dressed in his sailor’s suit and pretending to be captain of the town’s trams. He died penniless and his last remaining Drakenberg souvenirs were disposed of. 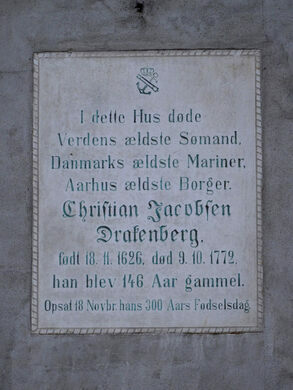 However, one of Johnsen’s contributions that remains is the plaque outside Drakenberg’s last house in Aarhus. It was installed on the November 18, on what would have been, if the stories are to be believed, the colorful sailor’s 300th birthday. A portrait of Drakenberg can be found in the nearby open air museum 'Den Gamle By' in the living quarters of merchant's house. Drakenberghus can be found nearby, at Mindebrogade 2. This seaworthy collection was sparked by one man's passion for sailing.